“Turn Left for Liverpool”, © Bob Hughes, 2018. Those who know their local maritime history may appreciate the significance of this picture. Before the present-day approach into Liverpool by the regularly dredged Queen’s Channel, ships had to navigate the dangerous Rock Channel along the Wirral coast. The lighthouses at Bidston, Leasowe and Hoylake played a vital role in this manoeuvre. When the ships saw that the Bidston and Leasowe lights were in line and likewise the two lights at Hoylake, this marked the spot where the ships should change direction, hence “Turn Left for Liverpool”. The picture is in a style which I called ‘Reverse Perspective’ when I devised it in 2016. But it all started a long time ago. 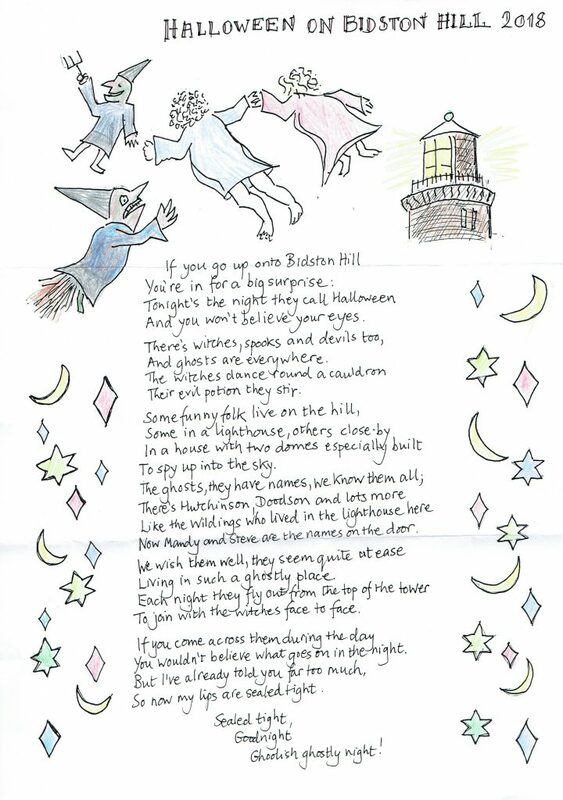 From my primary school window in Poulton I could see the windmill upon Bidston Hill, only a mile or so to the west. My eyes focussed on the windmill; I wasn’t interested in the houses, docks and warehouses in between. 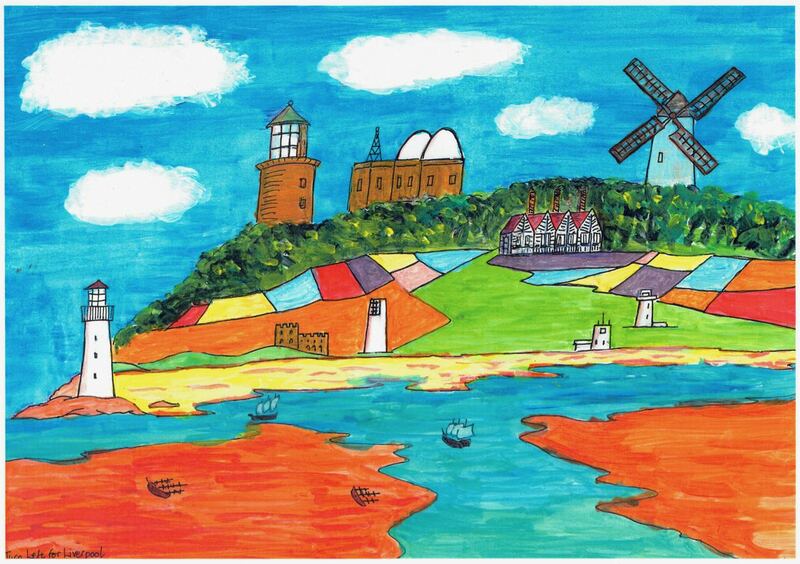 When in later life I wanted to paint a picture of this view, I realised it would be a boring job painting all those houses and docks with the windmill reduced to a tiny shape on the horizon. Simple answer: ignore them. Or at least reduce them to near irrelevance. The result: a complete reversal of normal perspective to “Reverse Perspective“. I have also broken most of the rules of TIME, SPACE, and COLOUR. Space: by moving buildings so that they are better positioned for the benefit of the composition as a whole. In the process – complete disregard for accuracy when depicting such buildings, nearly all drawn from memory. Time: in my pictures buildings or scenes from different ages of history can appear together, simultaneously. And Colour, of course: I want to paint bright, happy pictures, the more colour the better. People immediately recognise the places they depict. The contents of the pictures act as a stimulus to the real pictures, stories, knowledge of the places in your own head. It’s meant to be fun. Enjoy it. This entry was posted in Bidston Hill, History, Lighthouse and tagged BidstonHill, BidstonLighthouse, BidstonObservatory, Hoylake, Leasowe, lighthouse, Observatory, Windmill, Wirral on 6th November 2018 by admin. We received this in the post from an anonymous author. Now, where did I leave that Nimbus 2000? This entry was posted in Bidston Hill, News and tagged BidstonHill, Halloween on 31st October 2018 by admin. Wirral’s Sea Lights – Bidston and Leasowe Lighthouses – are to shine again for one night only, on Sunday 11th November 2018. The occasion is the nationwide “WW1 Beacons of Light” event, part of the “Battle’s Over” pageant which marks the centenary of signing the Armistice at the end of the First World War. This will be the first time that the Sea Lights have been lit together in more than 110 years. Leasowe Lighthouse last shone on 5th July 1908. Bidston’s light was put out for the last time at sunrise on 9th October 1913. It’s been more than a lifetime since the Sea Lights last shone together, so we can’t help being just a little bit excited. But our celebrations will be tempered not only by the reminder of the horrors of war, but also by nostalgia for the lost profession of lighthouse-keeping – it’s twenty years since the last lighthouse in England (North Foreland) was de-manned. Neither Bidston nor Leasowe Lighthouse will be open to the public on 11th November. At Bidston, there will be a small private gathering. The lights will be lit at 7pm and switched off around midnight. The character of both lights will be “white, fixed” (which means they are white in colour and don’t flash). This is the same as the historical character of the lights when they were last operational. The lights will be visible on the seaward side of the two lighthouses. Both lights are masked by the stonework of their lamp rooms, such that they will be visible for about 70 degrees either side of an imaginary line drawn from Bidston Lighthouse through Leasowe Lighthouse. To see both lights at the same time, you’ll need to be seaward of Leasowe Lighthouse. The lamps that we’re using are ex-service lanterns that we acquired from Trinity House early last year. These are fairly modern (about 15 years old), low-powered LED affairs. Bidston will exhibit a 3-tier SABIK LED-350 (36W) lantern, and Leasowe will exhibit a smaller 3-tier SABIK LED-155 (18W) lantern. These lamps both have a very narrow vertical divergence (about 2 degrees), which means that the light is concentrated into a narrow “focal plane” that widens slowly with distance. If my sums are correct, the bright part of Bidston’s light won’t intersect with an observer at sea level closer than about 4 miles, which is out at sea. Of course the lights will appear much brighter to an elevated observer at close range, like a drone perhaps. These lights are not as bright as the lamps that were used in the latter days of the Sea Lights. Another difference is the horizontal divergence. When Leasowe was last operational, it used an oil-burning catoptric light (i.e. a parabolic reflector) which gave a fairly narrow beam aimed at the horizon (so it wasn’t as bright off the central axis of the reflector). Bidston’s light was a first order dioptric lens with vertical condensing prisms, also oil-burning; the lens gave a focal plane, with a narrow vertical divergence, while the vertical condensing prisms concentrated the light from the focal plane into a beam centred on the Horse Channel. Peel Ports issued the official Notice to Mariners on 30 October 2018. The text is reproduced here. NOTICE IS HEREBY GIVEN that as part of the nationwide WWI Beacons of Light event, the disused lighthouses at Bidston and Leasowe will be re-lit temporarily. Mariners are advised that the temporary re-lighting of the two lighthouses is for commemorative purposes only, and the lights exhibited must not be considered as aids to navigation. “Turn left for Liverpool”, by Bob Hughes, October 2018. The Sea Lights were originally established in 1763 to guide ships through the Horse Channel, a safe passage between the sandbanks of Hoyle Bank and Burbo Bank in Liverpool Bay, before venturing through the Rock Channel and onwards to the Port of Liverpool. When the original lower light collapsed a few years later, a new lighthouse was built to replace it, 2.3 miles further inland on Bidston Hill. To make this work, Liverpool’s Harbour Master, William Hutchinson, came up with a new method of lighthouse illumination – oil lamps equipped with parabolic reflectors. Bidston’s reflector – a massive 12 feet in diameter – was probably the largest of its kind ever deployed in an operational lighthouse. It wasn’t long before Trinity House, the Northern Lighthouse Board and the rest of the world copied Hutchinson’s invention. The Sea Lights, at 2.3 miles apart, were the most widely separated pair of leading lights in the world. Bidston Lighthouse, 2.4 miles from the high water mark by Leasowe Lighthouse, claims the distinction of being the world’s most inland lighthouse ever. The Sea Lights were made obsolete by changes in Liverpool Bay. When Leasowe Lighthouse was discontinued, in 1908 the Horse Channel was barely navigable. Most ships were using the new Queen’s Channel, which is still in use today. The Association of Lighthouse Keepers, just because. Q. If I take a boat out on 11th November, will the Sea Lights guide me safely through the Horse Channel? A. No! Please don’t do that! The channels and sandbanks of Liverpool Bay have changed a lot since the Sea Lights were last operational. If you do take a boat into Liverpool Bay on the 11th November, you should be able to see the Sea Lights from several miles distance. But for navigational purposes, you should rely on your usual GPS equipment and up-to-date sea charts. There are more than 350 shipwrecks in Liverpool Bay, and we won’t be held responsible for another, despite Wirral’s age-old tradition of wrecking and smuggling! Q. Aren’t Bidston and Leasowe lit already? A. No, not really. At Bidston we have a strip of colour-changing LED lights which switch on around dusk and off after midnight. The light from these is unfocussed and can’t be mistaken for an operational Aid to Navigation. There’s a similar arrangement at Leasowe. Q. Why can’t you do this every night? A. There are strict regulations governing lighthouses and other aids to navigation, and we don’t want to be charged with setting false lights! Only Lighthouse Authorities are allowed to operate lighthouses. Peel Ports is the Local Lighthouse Authority for Liverpool, a responsibility they inherited from the Mersey Docks and Harbour Company. Trinity House is the Lighthouse Authority for England and Wales, the Northern Lighthouse Board (NLB) is the Lighthouse Authority for Scotland and the Isle of Man, and the Commissioners of Irish Lights (CIL) are the Lighthouse Authority for Eire and Northern Island. Both the NLB and CIL defer to Trinity House on certain matters. Q. What does “nominal range” mean? A. Without getting too technical, the “nominal range” is a measure of the strength of the light. It’s not related to the “geographic range”, i.e. the distance from which a shipboard observer in clear weather could be expected to see the light if it was bright enough. The geographic range is determined solely by the elevation of the light above the sea. When last operational, the Sea Lights were bright enough to be seen at the full limit of their geographic range (21 nautical miles for Bidston, and 14 for Leasowe). Q. When can I visit Bidston and Leasowe Lighthouses? A. Bidston Lighthouse is closed until Spring next year, although private tours can still be arranged during the winter months; details of future public open days will be posted on the Bidston Lighthouse Events page. The last two open days at Leasowe Lighthouse this season are on the 4th and 18th November, both Sunday afternoons; Leasowe Lighthouse will re-open on the first Sunday in March 2019. This article was updated on 31 October 2018 following the release of the official Notice to Mariners by Peel Ports. You can see all the Notices to Mariners for the Port of Liverpool on this page. This entry was posted in Lighthouse, News and tagged BidstonLighthouse, Leasowe, Leasowe Lighthouse, lighthouse, Notice to Mariners, Wirral, WW1 on 28th October 2018 by admin. Our season of open days for 2018 is drawing to a close. Saturday 15th September 12 noon – 3pm. 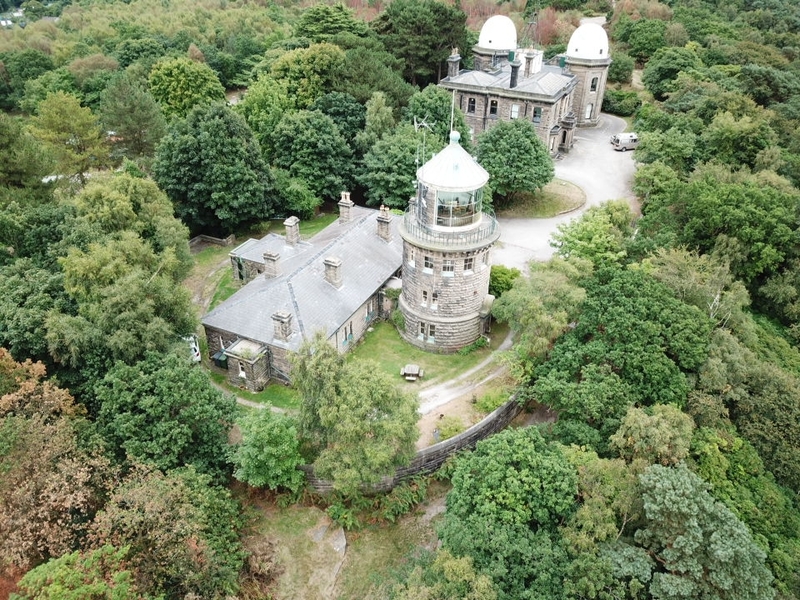 This is the first time that the Observatory has been open to the public since the Proudman Oceanographic Laboratory quit Bidston Hill in 2004! Aerial photograph of Bidston Lighthouse and Observatory. Photo by Geoff Shannon, 20 Aug 2018. Nearby, Bidston Windmill will open on Saturday 15th September from 10am – 12 noon. This is your last chance to see inside the Windmill this year. As the weather gets colder, bats will resume their winter residence. Sunday 14th October, 1pm – 5pm. We don’t usually open on Sundays, so this is an experiment for us. We’ll run guided tours at 1pm, 2pm, 3pm and 4pm on both days. For more information, see our events page. This entry was posted in News on 5th September 2018 by admin. We have a new gate. We hope you like it. The gate leads from the grounds of Bidston Lighthouse onto Bidston Hill, where it joins the path from Bidston Village to Bidston Windmill, alongside Penny-a-Day Dyke, the medieval wall. It replaces a derelict gate that had been disused for decades. We have wanted to renew the gate for a long while. The derelict gate was an eyesore, and Bidston Hill deserved better. A functioning gate would benefit visitors to the lighthouse as well as the many thousands who walk past it every year. 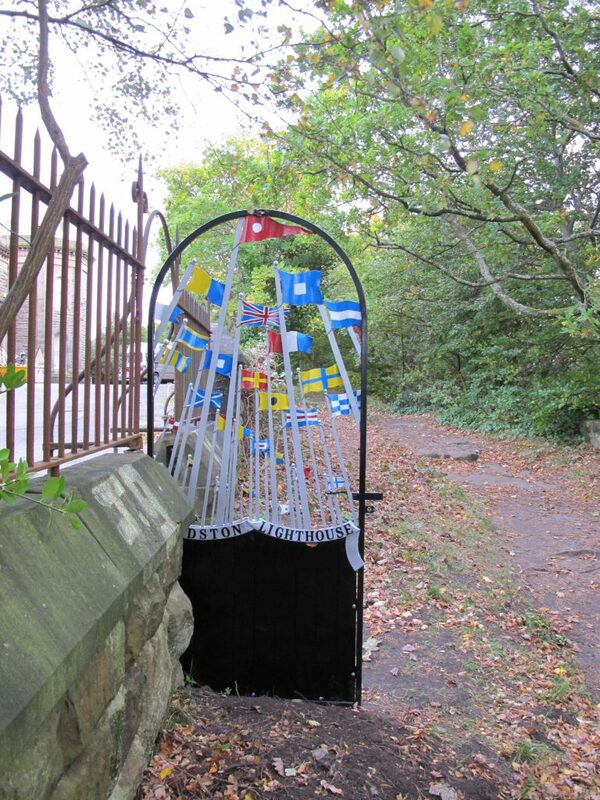 And wouldn’t it be nice if the gate could incorporate a motif reminiscent of the flag signals that used to run the length of Bidston Hill? So we applied to the Burbo Bank Extension Community Fund for financial support, and we were awarded a small grant. See below for more information about DONG Energy and the Burbo Bank Extension, and Grantscape, who administer the Burbo Bank Extension Community Fund. Next, we had to find a local blacksmith with the right skills for the project, and then work out the details of the design. When we found artist blacksmith Alex Price, we knew we had our man. What convinced me was some fine examples of his intricate metalwork, especially a fire-grate featuring a leaf motif – if anyone could work a flag motif into a bespoke gate, it was Alex. 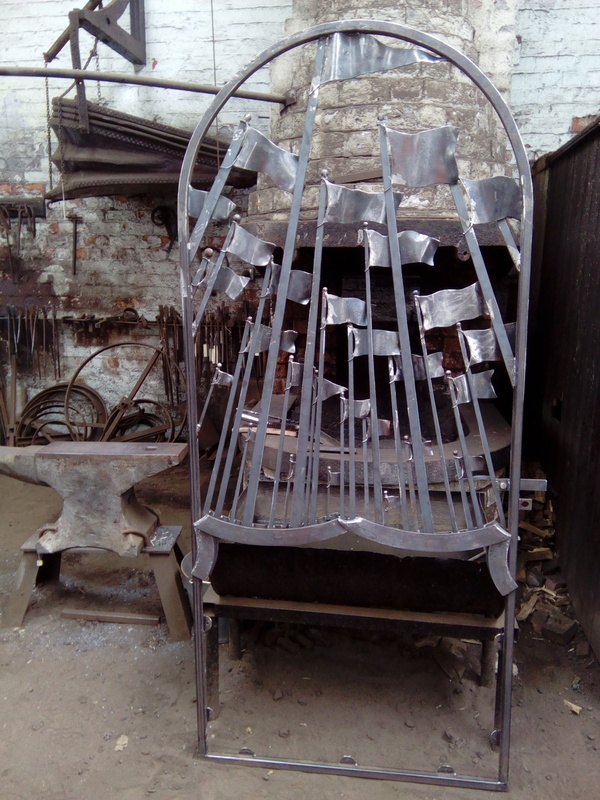 I visited his forge at the National Waterways Museum at Ellesmere Port and briefed him on the project: the gate had to fit into the existing opening, had to feature a flag motif, and should incorporate a wooden panel (in keeping with the old gate as well as the nearby “lych gate” at Bidston Observatory), and be achievable within our limited budget. Alex came back with a series of designs, one of which stood out. There was no turning back. This gate just had to be made. 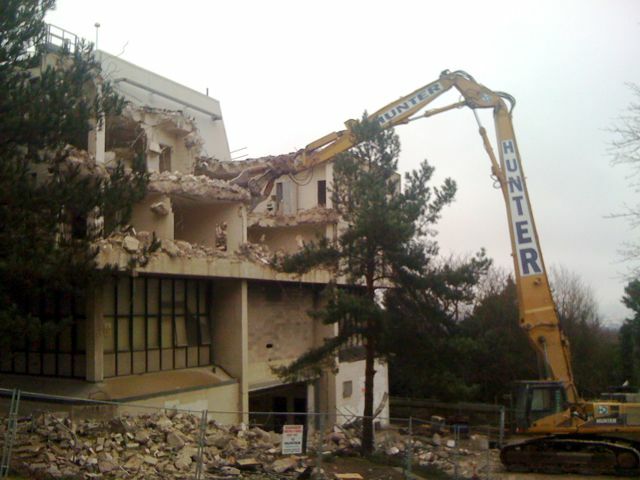 But before we could start work, we needed to obtain Listed Buildings Consent. You see, the wall in which the gate is located is a Grade-II listed building in its own right. The perimeter wall enclosing the site of Bidston Lighthouse and Bidston Observatory was remodelled in the 1860s by George Fosbery Lyster, Engineer-in-Chief to the Mersey Docks and Harbour Board, around the same time that the Observatory was built. The lower part of the wall is about a century older, probably dating back to when the Bidston Signals Station and Bidston Lighthouse were established. Apart from Listed Buildings Consent, we also had to obtain consent from everyone else who owned part of the building in question, namely Wirral Council, the Natural Environment Research Council, and the new owners of Bidston Observatory. We also discussed the project with the Friends of Bidston Hill. Needless to say, this process took several months, but finally the necessary consents were secured and we could give Alex the go-ahead. Edward Clive agreed to fabricate the wooden panel. The Friends of Bidston Hill helped out by clearing away some of the ivy which was encroaching on the wall. At the forge. Gate ready to be galvanised. The gate was installed on 15th September. 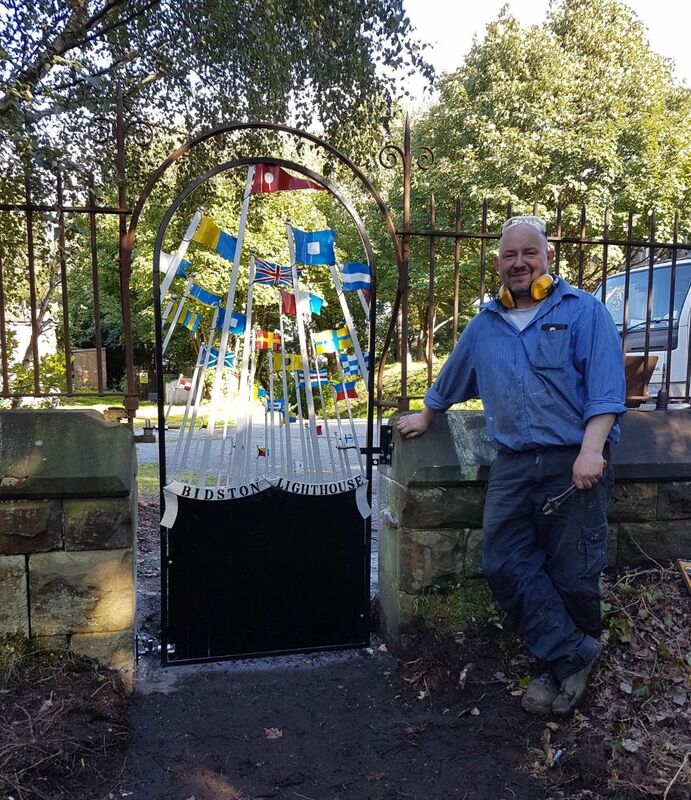 Blacksmith Alex Price by the newly installed gate to Bidston Lighthouse, on 15th September. There were other complications along the way. At some point in the past, tarmac, about 8 inches deep, was laid on the inside of the gate. We had to excavate this, and remove the tree roots and soil that had built up underneath the old gate. Eventually I uncovered the original sandstone threshold beneath the gate. I also exposed a telephone cable, which does not appear on any utility survey, but probably serves the lighthouse cottages. So I still have some work to do: bury the telephone cable and make a step up from the threshold to the level of the tarmac – and paint the railings, of course. Deciding on the colours for the flags and penants was a little tricky. We wanted to be historically accurate, only using flags that were known to be flown on Bidston Hill in the heyday of the flag signals. But there’s very little documentation on this subject. Salmon’s painting from 1825 shows a few flags in full colour; but in another painting by him of the same subject, he chose different colours for the same flagpoles. There is an 1807 engraving of the Bidston Signals in the collection of the Williamson Art Gallery, but the colours were added later, and may be fanciful. We don’t even know for sure whether the colours of flags shown on a flagpole were significant; the position of the flagpole was certainly important, and contemporary accounts describe people as counting the poles to determine if a certain shipowner’s flag is flying. There is some documentation on the house flags of shipping companies (such as Brown’s Book of Flags and Funnels) but this first appeared long after the Bidston Signals had ceased. So we compromised. We restricted the choice of colours to flags that were in one of several systems of flag codes for ships, viz. Marryat’s Flags, the Liverpool (or Watson’s) Code, the Commercial Code, and the International Code of Signals, even though these systems came along much later. If more information comes to light, we can always re-paint them! DONG Energy (NASDAQ OMX: DENERG) is one of Northern Europe’s leading energy groups and is headquartered in Denmark. Around 6,200 ambitious employees, including over 900 in the UK, develop, construct and operate offshore wind farms, generate power and heat from our power stations as well as supply and trade in energy to wholesale, business and residential customers. The continuing part of the Group has approximately 5,800 employees and generated a revenue in 2016 of DKK 61 billion (EUR 8.2 billion). For further information, see www.dongenergy.co.uk or follow @DONGEnergyUK on Twitter. GrantScape is a grant-making charity committed to enhancing the environment and strengthening local communities through its grant programmes. GrantScape’s experience stretches back to 1997 and it has awarded grants totalling over £80 million to deserving projects over this time. GrantScape manages a range of community and environmental grant programmes on behalf of corporate and local authority clients. These are tailored to their individual requirements, which is the charity’s speciality. In addition, GrantScape offers a professional project management and grant process review service to groups requiring support with these activities. For further information, please see www.grantscape.org.uk or follow @GrantScape1 on Twitter. The Burbo Bank Extension offshore wind farm is located 7km off the coast of Liverpool Bay, at the entrance to the River Mersey. Onshore construction began in 2015, offshore construction started in 2016 and the project was officially opened in May 2017. The offshore wind farm has a total capacity of 258MW, enough to power over 230,000 homes. The project is owned by DONG Energy (50%), PKA (25%) and The Lego Group (KIRKBI A/S) (25%). For further information, please see: www.burbobankextension.co.uk. Applications to the Fund are made using an online application system via the GrantScape website www.grantscape.org.uk. 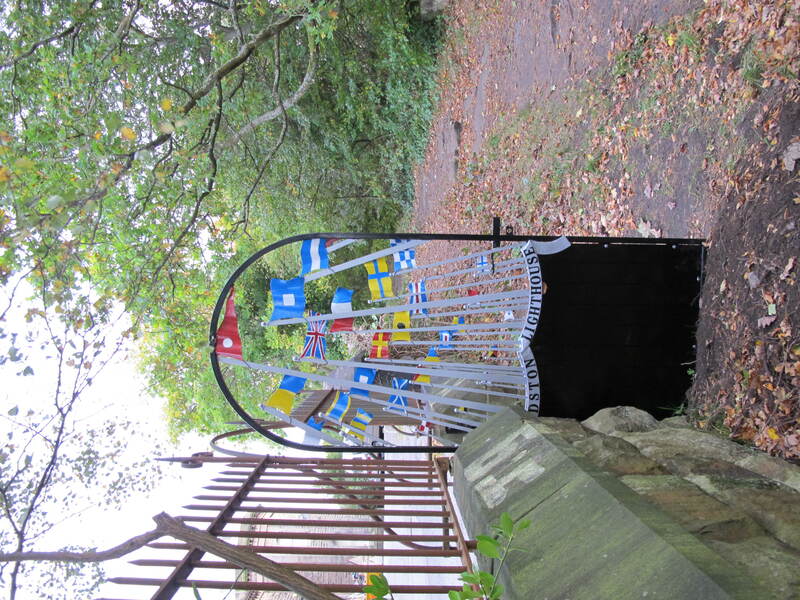 This entry was posted in Bidston Hill, Lighthouse, News and tagged BidstonHill, BidstonLighthouse, flags, gate, ListedBuildingConsent, Signals on 16th October 2017 by admin. Last week, I had the good fortune to visit Hull for the Maritime Heritage Forum. I’d been thinking about Hull – or Kingston-upon-Hull to give it its full name – for a while. Like Liverpool, Hull’s heritage derives from the sea, and I wanted to explore the connections. The Trinity House of Kingston-upon-Hull is the oldest of the three surviving Trinity Houses, the others being Trinity House of Newcastle-upon-Tyne, and the Trinity House of Deptford Strond. The last one is the Lighthouse Authority for England and Wales, but all three have had various maritime responsibilities over the years. In Hull, this is especially confusing, because the jurisdictions of the Trinity Houses have often overlapped, to the discomfort of both Kingston-upon-Hull and Deptford Strond. At one time, Samuel Pepys has a position of authority in both organisations. Some aids to navigation built by Trinity House (Hull) are now operated by Trinity House (Deptford Strond). 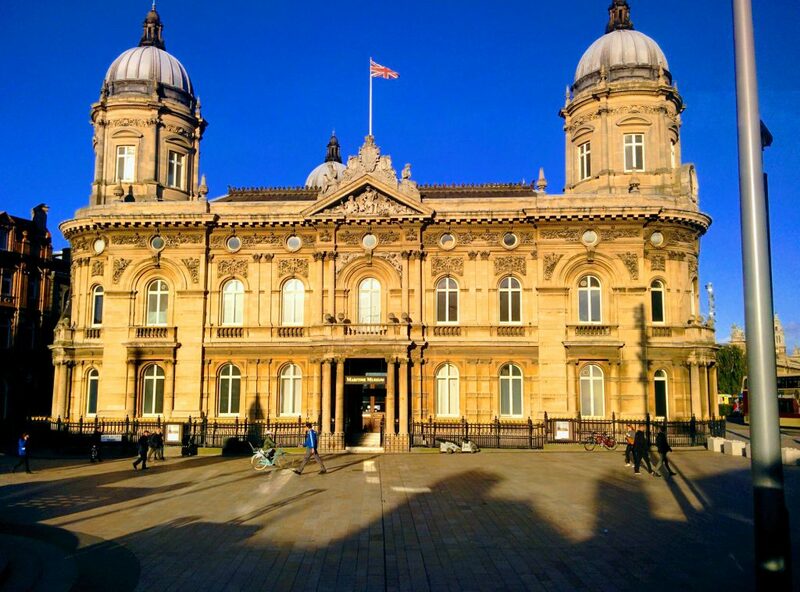 If someone in Hull mentions Trinity House, its rarely clear which organisation they mean, and more than once I was left with the impression that the speaker thought the two Trinity Houses were branches of the same organisation. During the heyday of lighthouse construction, both Hull and Liverpool found themselves at odds with Trinity House of Deptford Strond. As a lighthouse enthusiast, I had to make the pilgrimage out to Spurn Lighthouse. The lighthouse is no longer operational, and the site is now managed by the Yorkshire Wildlife Trust. It’s a long hike out to the lighthouse from the nearest public parking – the Spurn was breached by the sea a few years ago, and the road out to the lighthouse is no longer open – so I booked a place on the Spurn Safari Unimog. The history of the Spurn Lighthouses (there have been many, including one built by Smeaton himself) is a fascinating intersection of changing technology, politics, and geography. Spurn Head (or just “the Spurn”) is a spit at the northern bank of the Humber estuary – and it’s constantly changing. It’s possible that there’s been as many as four distinct Spurns in the last 1000 years, each new one building up as the previous is breached and destroyed by the sea. Both Hull and Liverpool have traditions of telecommunications, born out of the ports’ hunger for information. This is reflected in the fact that in 2017, both cities hosted completely independent art projects with the same title: “I wish to communicate with you”. You see, in the International Code of Signals, the flag for the letter “K” (pronounced “Kilo”), when flown alone, means “I wish to communicate with you”. In Hull, this inspired a full-colour makeover of the Thornton Estate. Back in Liverpool, “I wish to communicate with you” was the title of a project by artist Yu-Chen Wang, as part of the New Observatory Exhibition at FACT, curated by Sam Skinner. Another outcome of Yu-Chen Wang’s project was a short film, shot mostly at Bidston Observatory and Bidston Lighthouse, entitled – wait for it – “I wish to communicate with you” and screened at FACT on 27 September. This was my first and probably last appearance as an actor. Liverpool and Hull share a more historic connection. In the first half of the 19th century, both cities had optical (semaphore) telegraphs, connecting the port to the coast, and both were built by the same man, Barnard Lindsay Watson. Naturally, I wanted to find out more about the Hull-Spurn telegraph. So I asked almost everyone I met, including historians, archivists and guides, at lighthouses, libraries, museums, and lightships, whether they knew anything about, or even heard about, the Hull-Spurn telegraph. No-one knew anything. Most looked blank. Only one or two thought it rung a bell. This brings me at last to the main purpose of this post, to set down what little I know about the Hull-Spurn Telegraph. In an earlier post, I noted that a certain Mr Boaz proposed, way back in 1803, to construct a system of telegraphs linking Liverpool to other major seaports in the United Kingdom, including Hull. Although the Admiralty did establish a line of coastal signal stations in 1804, it wasn’t until much later that commercial telegraphs began to appear, the first of these being Barnard Lindsay Watson’s Liverpool-Holyhead telegraph in 1826. 1839 was a tumultuous year for Watson. January brought the great gale of 1839, which laid waste to much of the Liverpool-Holyhead telegraph. Watson started to re-build. In the original telegraph, each station had a single tall mast with three pairs of semaphore arms, each of which could signal a digit from 0-9, and an extra indicator on top. 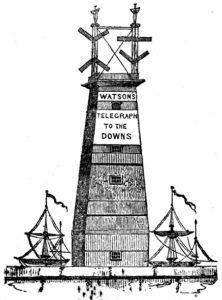 The new telegraph had two, shorter masts, each with two pairs of arms, giving an enlarged vocabulary of 10,000 words. Around this time, in an effort to raise funds, Watson announced that only subscribing vessels would be reported by the telegraph. In March of the same year, the Hull Chamber of Commerce and Shipping commissioned Watson to survey potential sites for a telegraph along the Humber. The Liverpool Dock Committee didn’t take kindly to all this. This was not the behaviour the Trustees expected of an employee. Watson’s outside interests could no longer be tolerated. Watson had been allowed to sell his propriety flag signals to ship-owners for many years. But when the Dock Committee learned that he’d been secretly collecting intelligence for insurance companies, it was the last straw. In May 1839, the Liverpool Dock Committee dismissed Watson. The re-construction of the Liverpool-Holyhead telegraph was completed under a new superintendent, Lieutenant William Lord, R.N. Perhaps relieved to be freed of his obligations to the Liverpool Dock Committee, Watson pressed on with the construction of a new telegraph linking Hull to Spurn Head. The telegraph opened in September 1839. Stations in the Hull-Spurn optical telegraph. From “The Old Telegraphs” by Geoffrey Wilson. 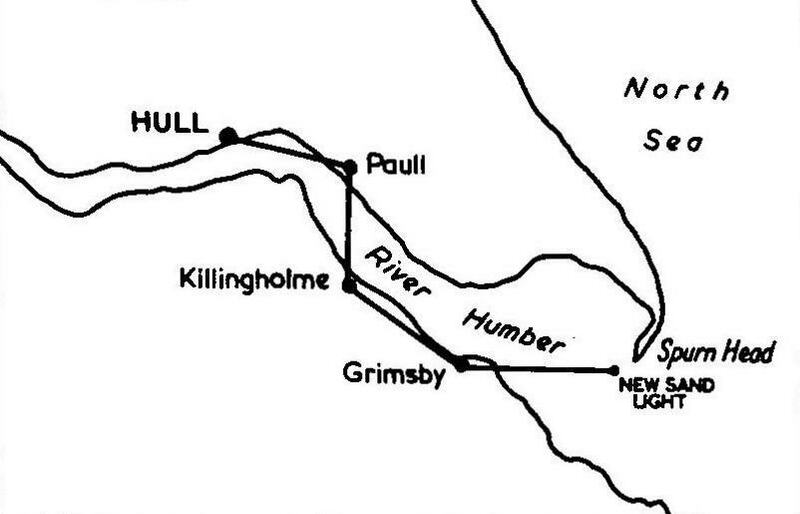 The line criss-crossed the Humber estuary, with stations at Hull, Paull, Killingholme, Grimsby with the last (or first station) at “New Sand Light”. So, where or what exactly was “New Sand Light”? It probably wasn’t on the Spurn proper, if Geoffrey Wilson’s sketch in his excellent book “The Old Telegraphs” is to be trusted. My guess is a lightship at the Bull Sands station, which was establised in 1832. Watson himself mentioned “the valuable assistance afforded me by the Corporation of the Trinity House, in granting me permission to place a telegraph on board their floating light off the Humber”. a line linking London to the Kentish downs, terminating at the old Shot Tower near London Bridge. This ran only briefly, from about 1842 to 1843, when the station in London was destroyed by fire. a line linking Southampton to the Isle of Wight (with stations at Southampton, Ashley Down, St Catherines, and the Needles). a line from Dartmouth to Start Point (possibly never completed). He also established independent (i.e. not part of a telegraph) signals stations at various places around the country, such as Flamborough Head. Very often these stations were located at or near the site of an existing lighthouse. Watson went bankrupt more than once: in 1831, while a flag manufacturer in Liverpool; and again in 1842, now based in London and Kent. Following his 1842 bankruptcy, Watson re-launched the General Telegraph Association as a joint stock concern. The fire of 1843 was the last straw. The semaphore tower was not insured, the London smog was an ongoing problem, and new technology – the electric telegraph – posed an emerging threat. Watson left the telegraph business, and set himself up as a hotelier, at the Pulteney Hotel in Bath (now the Holburne Museum) only to go bankrupt again, in 1848. His last gig was as manager of the refreshment rooms at the Crystal Palace in Sydenham. He died in Suffolk in 1865, and was buried at St Peter’s, Monks Eleigh. 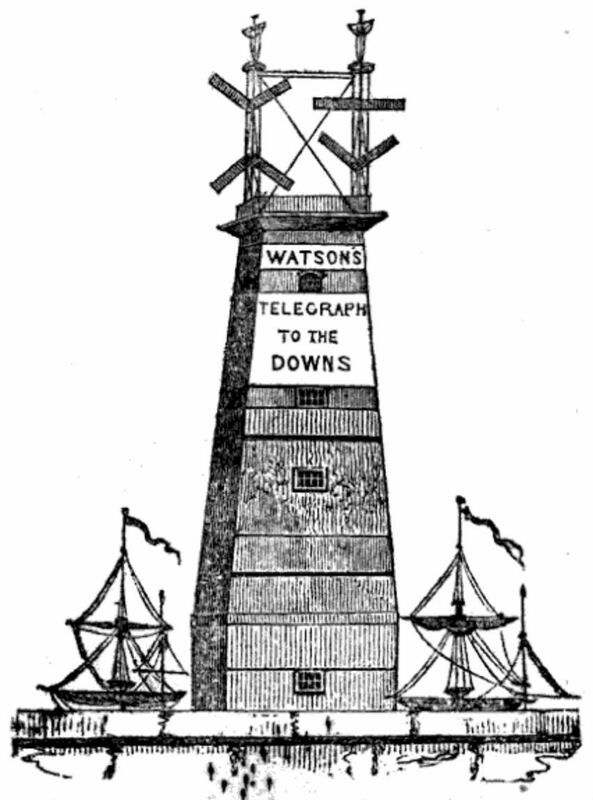 Only two of Watson’s telegraphs survived the failure of the General Telegraph Association. The Liverpool-Holyhead telegraph was the longest lived. The Liverpool-Holyhead line continued until 1861, when a new electric telegraph along (approximately) the same route was finally completed. Construction had started in 1858 and the line was partially operational in 1859, but submarine crossings proved problematic – this is why Puffin Island was removed from the circuit. The Hull-Spurn optical telegraph survived the failure of Watson’s General Telegraph Association, and continued independently as the General East Coast Telegraph and finally as the Hull and East Coast Marine Telegraph Association. Just as in Liverpool, it was the advent of the electric telegraph that doomed the optical one. Part of the line (Hull-Grimsby) was relaced by a new electric telegraph in 1857, leaving only the Grimsby-Spurn leg to the semaphore. This was not a satisfactory arrangement, as the electric and semaphore telegraph stations in Grimsby were too far apart. Ultimately, the electric telegraph was extended to Cleethorpes where incoming ships could be observed, and the semaphore stations abandoned altogether. In its adoption of the electric telegraph, Hull was – for once – ahead of Liverpool. “The Handbook of Communication by Telegraph”, H.K. Causton & Company, 1842. “A History of the Spurn Lighthouses”, G. de Boer, East Yorkshire local history series, 1969. “The Old Telegraphs”, Geoffrey Wilson, Phillimore and Co. Ltd, 1976. “Spurn Head Postal History”, by Ronald Ward, publ. Yorkshire Postal History Society, 1988. “Faster Than the Wind: A History of and a Guide to the Liverpool to Holyhead Telegraph”, by Frank Large, edited by David Roberts, 1998. Distant Writing: A History of the Telegraph Companies in Britain between 1838 and 1868, especially Chapter 8: Non-Competitors, by Steven Roberts, 2012. Retrieved 12 Nov 2015. The Royal Signals .. Mechanical Telegraphy Page 1. Retrieved 9 Oct 2017. This entry was posted in History, Lighthouse and tagged Boaz, History, Hull, Liverpool, Semaphore, Spurn, telegraph, Watson on 9th October 2017 by admin. The “unknown Scottish lighthouse” in my last post is probably Turnberry. 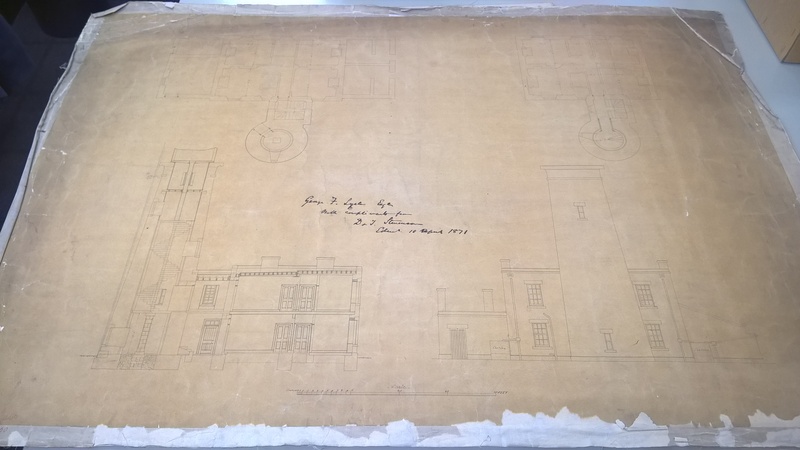 The drawing was found in a box of plans in the Mersey Docks and Harbour Board collection at the Merseyside Maritime Museum Archives. The handwritten annotation reads “George F. Lyster Esq. with the compliments of D. &. T. Stevenson, Edin. 10 April 1871”. Several lighthouses designed by David and Thomas Stevenson have the lighthouse tower connected to a two-story accommodation block, but the only one where the positions of the windows and chimneys match those in our drawing is Turnberry. I have not been able to find any photographs of Turnberry Lighthouse taken from a vantage point looking directly towards the tower (as in the elevation in the right of the drawing). Perhaps it’s just not possible to stand in the right place to take such a photograph. 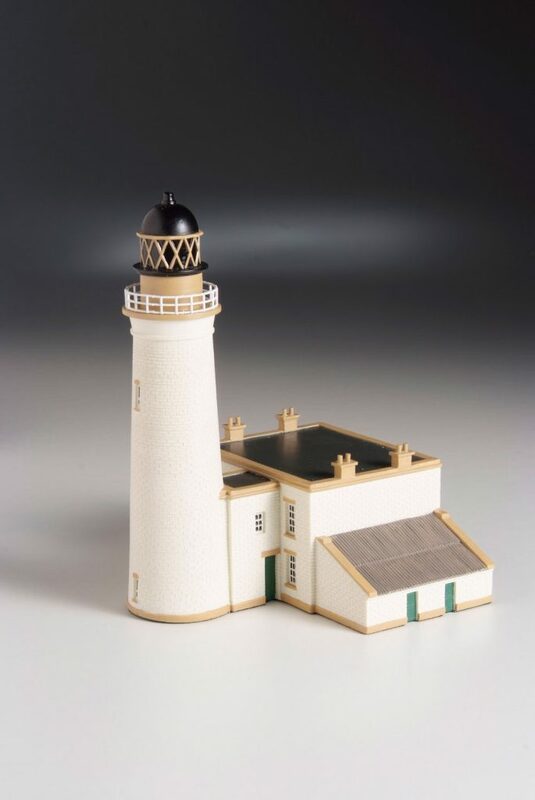 Fortunately, Little Dart have a nice model of Turnberry Lighthouse, in their Northern Lighthouse Board collection. At the time when the Stevenson brothers sent the drawing to George F. Lyster, Turnberry Lighthouse was still under construction, and Lyster had not yet drawn up his plans for the re-build of Bidston Lighthouse. Turnberry was first lit in 1873. Today, Turnberry Lighthouse is still operated by the Northern Lighthouse Board, while the accommodation is part of Donald Trump’s empire. I can’t afford to stay there. The building has been altered since the Little Dart model was made. This photograph of Turnberry Lighthouse is taken from a different angle, but shows the distinctive locations of the windows in the lighthouse tower and the chimneys of the accommodation. Thanks @NLB_UK. 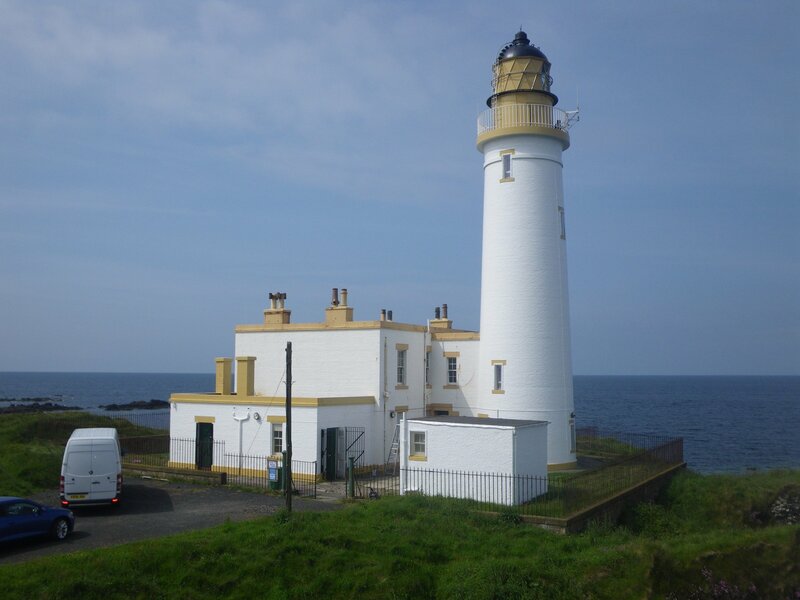 This entry was posted in History, Lighthouse, News and tagged BidstonLighthouse, Lyster, Scotland, Stevenson, Turnberry on 9th October 2017 by admin. Robert Stevenson, the Scottish Lighthouse Engineer, first visited the Wirral Lighthouses in 1801, while he was still learning his trade, six years before he started construction on the Bell Rock Lighthouse. Stevenson returned to Wirral in February of 1828 to carry out an investigation of the Cheshire shore, between the Mersey and the Dee, in the company of William Laird (the shipbuilder) and Sir John Tobin (former slaver, privateer and Mayor of Liverpool). Presumably his expertise was enlisted after the sea breached the bank at Leasowe on 16-18 February, and threatened to turn much of Wirral into a “permanent salt lake”. Stevenson promptly presented his findings to the Wernerian Society in Edinburgh on 8th March 1828. His account of these investigations touched upon the submerged forest of Meols, the loss of the original lower sea-light at Leasowe, and the general encroachment of the sea upon the land. Today, we would explain this encroachment in terms of rising sea levels caused by global warming, but terms like “climate change” and “global warming” were not part of Stevenson’s vocabulary. The construction of a new embankment at Leasowe commenced in 1829. Here is the full text of Stevenson’s 1828 paper, transcribed from the Edinburgh New Philosophical Journal. By Robert Stevenson, Esq. Civil-Engineer, F.R.S.E., M.W.S., &c. Communicated by the Author. On a former occasion, I had the honour to make a few observations, which appeared in the 2nd volume of the Society’s Memoirs, regarding the encroachment of the sea upon the land generally. The present notice refers only to that portion of the coast which lies between the rivers Mersey and Dee, extending to about seven miles. To this quarter my attention, with that of Mr Nimmo, Civil Engineer, had been professionally directed in the course of last month. In our perambulatory survey we were accompanied by Sir John Tobin, and William Laird, Esq. of Liverpool, along the Cheshire shore, and its connecting sand banks, between Wallasea Pool, in the Mersey, and Dalpool, in the river Dee. Within these estuaries, the shores may be described as abrupt, consisting of red clay and marl, containing many land or boulder stones, of the cubic contents of several tons, and very many of much smaller sizes, diminishing to coarse gravel. But the foreland, or northern shore, between these rivers, which I am now to notice, is chiefly low ground, and, to a great extent, is under the level of the highest tides. The beach, or ebb, extends from 300 to 400 yards seaward and, toward low-water-mark, exposes a section of red clay ; but, toward high water, it consists of bluish coloured marl, with peat or moss overlaid by sand. This beach, at about half-tide level, presents a curious and highly interesting spectacle of the remains of a submarine forest. The numerous roots of trees, which have not been washed away by the sea, or carried off by the neighbouring inhabitants for firewood, are in a very decayed state. The trees seem to have been cut off about two feet from the ground after the usual practice in felling timber, and the roots are seen ramifying from their respective stumps, in all directions, and dipping towards the clay subsoil. They seem to have varied in size from 18 inches to perhaps 30 inches in diameter, and, when cut with a knife, appear to be oak. Several of the boles or trunks have also been left upon the ground, and being partly immersed in the sand and clay, are now in such a decomposed state, that, when dug into with a common spade, great numbers of the shell-fish called Pholas candida, measuring about three-fourths of an inch in length, and two inches in breadth, were found apparently in a healthy state. These proofs of the former state of this ebb or shore, now upwards of 20 feet under full tide, having been once dry land to a considerable extent beyond the region of these large forest trees, were rendered still more evident by the occurrence of large masses of greenstone, which, at a former period, had been imbedded in the firm ground here, and especially on the shore within the river Dee. It may farther deserve notice, that the inhabitants of this district have a traditional rhyme, expressive of the former wooded state of this coast, where not a tree is now to be seen, viz. “From Halbre Isle to Birkenhead a squirrel may hop from tree to tree;” that is from the Dee to, the Mersey, now presenting a submarine forest. As these evidences of great changes upon the state and former appearances of the land were highly interesting to the party, and intimately connected with the professional inquiries of myself and colleague, it seemed desirable to get them, if possible, corroborated by oral testimony. Sir John Tobin accordingly, very obligingly, took measures for examining the oldest people in the neighbourhood, as to their recollection of the former state of these shores. In particular, Thomas Barclay, aged 93 “all but two months”, by profession a mason and measurer of country work; Henry Youd, labourer, aged 86; and John Crooksan, labourer, aged 80, were examined. Barclay stated, that he had been employed at the erection of the Leasowe landward Lighthouse in the year 1764; that there were then two lighthouses near the shore, for a leading direction to shipping through the proper channel to Liverpool ; and that the Sea Light became uninhabitable, from its being surrounded by the sea. A new light was then built upon Bidstone Hill; and the present Leasowe Lighthouse, formerly the landward light, which he had assisted in building, became the sea-light. He could not condescend upon the distance between the two original lights, but was certain that it must have been several hundred yards; that he knows that, in the course of thirty years, the shore of the Leasowe lost, by measurement, eleven Cheshire roods, or 88 yards; and verily believes, that, since he knew this shore, it has lost upwards of half-a-mile of firm ground. To the correctness of these statements, the other two aged men gave ample testimony; Henry Youd having also worked at the Lighthouse. As to the present state of things, the party alluded to were eye witnesses of the tides, on the 16th, 17th and 18th of February 1828, having exhibited a very alarming example of the encroachments of the sea upon the Leasowe shore. At high-water it came over the bank, and ran in a stream of about half-a-mile in breadth, surrounded the lighthouse, and continued its course through the low grounds toward Wallasea Pool, on the Mersey, thereby forming a new channel, and threatening to lay several thousands of acres of rich arable and pasture lands into the state of a permanent salt lake. The present Leasowe Lighthouse, which, in 1764, was considered far above the reach of the sea, upon the 17th of February last was thus surrounded by salt water, and must soon be abandoned unless some very extensive works be undertaken for the defence of the beach, the whole of the interior lands of the Leasowe being considerably under the level of high-water of spring-tides. This coast, with its sand banks in the offing; its submarine forest, and the evidence of living witnesses as to the encroachment of the sea upon the firm ground, is altogether highly interesting to the geological and scientific enquirer. The remains of forests in the bed of the ocean occur in several parts of the British coast; particularly off Lincoln; on the banks of the Tay, near Flisk; at Skiel, in the Mainland of Orkney, and in other places, noticed in the Transactions of this Society, and are strong proofs of the encroachment of the sea upon the land. However difficult, therefore, it may be to reconcile the varied appearances in nature, regarding the sea having at one time occupied a higher level than at present, yet its encroachment as a general, and almost universal principle, seems to be beyond doubt in the present day. Since I had last the honour of addressing the Society on this subject, opportunities have been afforded me of making many additional observations on the British shores; and of personally extending these to almost every port on the Continent, between the Texel and the Garonne. I have also through the obliging communications of friends, been enabled to extend my inquiries to other quarters of the globe; and I am now prepared to state, that, with a few comparatively trifling exceptions, the sea appears to be universally gaining upon the land, tending to confirm the theory, That debris, arising from the general degradation of the land, being deposited in the bed of the minor seas, is the cause of their present tendency to overflow their banks. This entry was posted in History and tagged Bidston, ClimateChange, Leasowe, Stevenson, Wirral on 21st September 2017 by admin.